"I can't believe it's not glass!" Our dining room with secondary glazing installed on painted wooden frames. Sweet basil and a potted avocado tree in evidence. What is Secondary Glazing ? Secondary Glazing is retrofitted plastic double glazing. You get significant benefits in heat and sound insulation from the trapped air between the panes. An additional benefit is much reduced condensation on the windows, which is very beneficial to your old wooden joinery if you happen to have it. The commercial systems are generally about half the cost of retrofitted glass double glazing. The prices for glass and plastic respectively being in the regions of $400 per square metre and $200 per square metre in New Zealand. Doing it yourself works out under $50 per square metre. Cast acrylic sheet is relatively cheap at around $35 per square metre dollars for low grade. Don't let the grade worry you too much. One supplier I approached tried to convince me I needed A grade UV resistant plastic at about $100 a square metre! Yeah right. I eventually found Award Plastics and talked to Aaron who assured me that they had done this before and the cheapest grade was more than adequate. It certainly looks fine with little distortion or visible marking. The plastic is installed inside the glass so the worst of the UV is filtered out before it hits the plastic anyway. The plastic comes in 1.2 x 2.4 metre or 2 x 3 metre sheets. I supplied the company with a cutting plan that I hand optimised to fit the sheet sizes available with the aim of producing as little waste offcuts as possible. To glaze wooden joinery one needs to measure the window to the inside of the frame and then add about 30mm to each dimension. This gives 12mm per side for the magnet and a few mm of tolerance. Award Plastics took the cutting plan and cut the plastic as required for no extra charge. To attach the plastic to the window frame I used brown vinyl magnetic strip, similar to the magnets used in a refrigerator. This can be bought from magnets.co.nz. I bought the 1.2mm x 12mm strip. There is the option of buying the matching A/B pair but this is more expensive and only comes with self adhesive tape. I found that most of the single side strip that they sell will mate with itself correctly in one orientation but not the other. The A/B pair is designed to correctly mate in either orientation. It pays to check with the staff of your supplier to ensure that the magnet will indeed mate with itself. Improperly mated magnet - note the offset sideways. Initially I tried using self adhesive magnet on both the window frame and the plastic. This worked for a while but the self adhesive glue stays tacky and slowly creeps with the weight of the plastic. 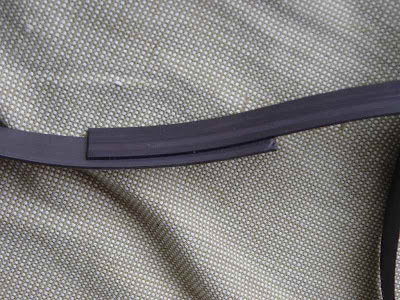 The consequence was that the sheets of plastic started detaching, usually on the frame side. In the end I realised that a curing glue was required and so I switched to using Ados F2 contact adhesive on both the frames and the plastic. 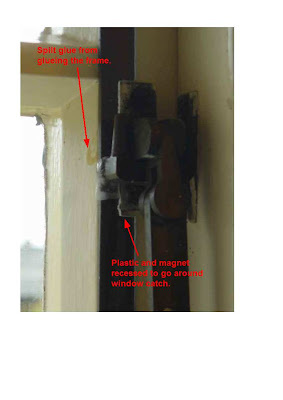 You will usually need to cut recesses into the plastic and magnet to clear your window fittings. I did some of my windows with a coping saw and some with band saw. I finished the recesses off with a belt sander. The amount of energy you spend on this step will depend on how tidy a finish you require. It is important to prepare the surfaces to be glued carefully. On varnished frames the varnish should be scraped off to reveal bare wood. On painted frames the paint just needs to be cleaned, provided that it is in good condition. When using contact adhesive one only gets one shot at the positioning of the glued pieces so be very careful. Cut the magnet, two strips to fit each edge of the plastic for a total of eight strips. Peel the protective film off one side of the plastic. Apply glue to the edges of the plastic where the magnet will fit. Apply glue to the the magnet that will be fitted to the plastic. Once the glue is tacky, carefully fit the magnet to the plastic. Hold the plastic in position on the window and mark lightly the location with a pencil. Apply glue to the window frame in a 12mm strip next to your marks. Apply glue to the the magnet that will be on the frame. Once the glue is tacky, mate the frame magnets to the magnets already glued to the plastic. Make sure that they are mated properly (see pictures above). Carefully hold the plastic in position on the window and press it into place. Press around the edge of the plastic to make sure it is glued down. Remove the plastic carefully from the window by separating the mated magnets. Press firmly on the magnet glued to the frame to ensure a good bond. Peel the remaining protective film off the plastic. Replace the plastic back on the window. A further update. April 2011. Thanks to Sarah in the comments tipping me off to the fact that Award Plastics now offers a range of systems for DIY secondary glazing from Tubeway Ltd in the UK। The pricing is fairly steep for the EasyGlaze which is the system that looks the best to me. Check out this, A thesis on secondary glazing!